They're almost as cute as your kids! 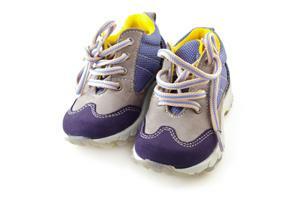 A sturdy, flexible pair of toddler shoes is imperative for youngsters. During these formative years in a child's life, the little one will run around, play, learn how to walk, attend preschool, learn to maintain proper balance and experience the general mishaps that occur during childhood. It is important to invest in a pair of high-quality shoes that will serve your child's activities and lifestyle well. Lightweight: The shoes should not be heavy and should not impede or conflict with the child's movement. Flexible: The shoes should not bind the child's foot uncomfortably, nor should they restrict mobility of the toes. Breathable: The shoes should be airy and constructed using natural materials, so as to allow the feet to remain healthy. Flat: The shoes should simulate a bare foot, and should not have any arch support. A wide variety of toddler shoes exist. From practical to dressy to adventurous, there is a shoe type to fit the needs of all toddlers. Consider the busy lifestyle you already lead. Juggling family life with your other responsibilities is a chore indeed, but little shortcuts here and there can make your daily activities much easier. The smallest things can add up to plenty of time saved - including the types of shoes you purchase for your toddler! Velcro toddler shoes are an ideal option for you and your child. Toddler laces are small and can often be difficult to tie, particularly if the toddler in question is not sitting still. In this case, consider Velcro as an alternative. These shoes slip on snugly and stay comfortably secure with the quick turn of a flap. They are, of course, also perfect for young children who have not yet learned to tie their own laces. Pediped: Pediped's shoes are especially designed with your toddler's developing foot in mind. They offer a wide selection of styles and colors. Crazy 8: A haven of baby and toddler products, this store offers a wide variety of toddler shoes.